Rancho Santana is a world-class resort and residential community located on the Pacific coast of Nicaragua. It boasts 2,700 acres of rolling hills and two miles of rocky and dramatic shore, broken up by five distinct beaches nestled in their own hideaways. Tucked between the vast Pacific and immense Lake Nicaragua, Rancho Santana has the distinction of being one of the only isthmuses on the entire Pacific Ocean. An isthmus is defined as a strip of land that is bordered on both sides by water, yet connected on each end by land. This rare geographical phenomenon gives the Ranch nearly constant breezes. These breezes are an enjoyment all their own, but also create some of the world’s most vertical waves, providing both visual drama as well as world-class surfing. 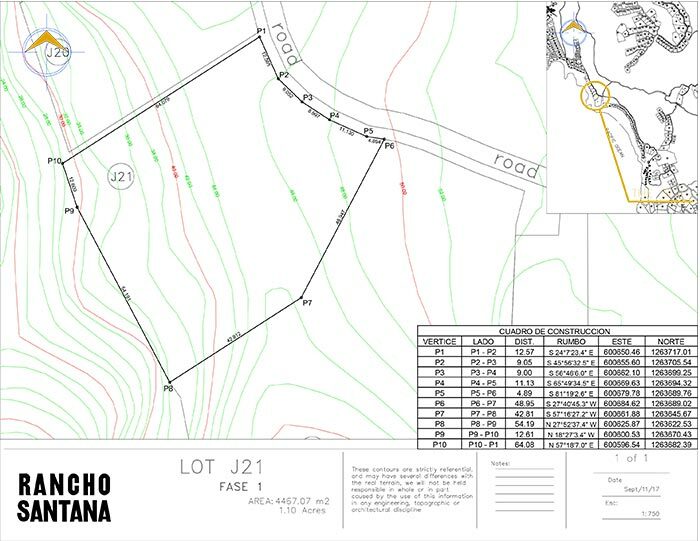 The lot J-21 is located in Las Playas is on one of the last undeveloped ocean front areas of Rancho Santana. The lot includes a path down to two secluded coves, one with tidal pools and a small beach area​, a very unique feature and one that none of the constructed properties possesses. The area is just over an acre and the survey is below. The location is ideal in that it is centrally located within Rancho Santana, making it quick and easy to access both ends of the Resort and Development. This lot is very close to the popular Playa Escondida.